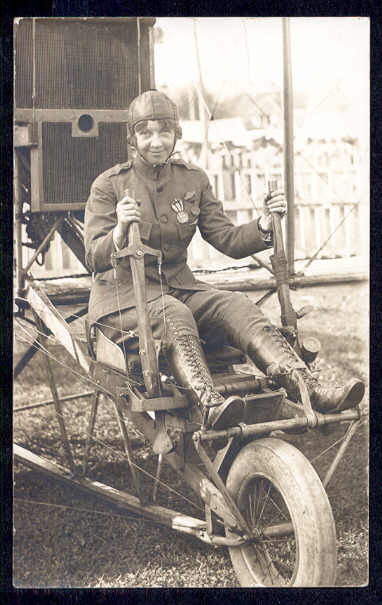 Our website controller Christian Gerbich was asked by a friend if he could identify a photographic pioneer aviatrix card – see below. The whole card + face and medals enlarged. This was the best clue as the style is one commonly found on real photo cards of US origin. Also pointing in the same direction was the aircraft which resembled an early Curtiss. In pre-Web days that would have been as far as one could go without seeking out publications on US women flyers pre WW1. 1912 First flight. Buys a Wright biplane from Orville. 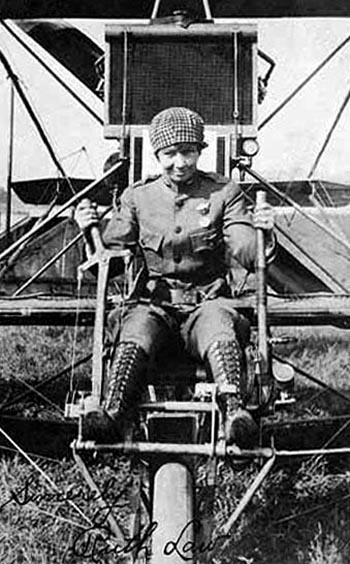 First woman to fly at night. Flying in Florida at Daytona Beach. Embarks on display circuit and marries her manager Charlie Oliver. 1916 Record flight from Chicago to New York in a Curtiss. Breaks US distance record and world womens distance record. Landing at New York her engine is serviced by an Army lieutenant later to head the USAAF Hap Arnold. 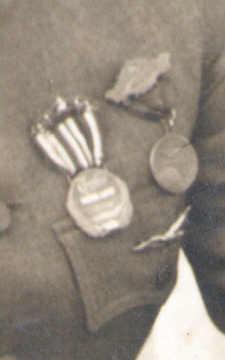 Awarded the Glen Curtiss Medal and the US Aero Club medal for cumulative achievements. 1917 Earning $9000 a week from flying – presumably in peak season. Accepted into US Army but not for combat flying. Continues on show circuit to raise money for War Bonds & Red Cross. Presumably when the cards were made as she is in uniform with the medals. 1919 While in the Philipines flies the first air-mail in the then US colony, Resumes the show circuit with her own team. 1922 Retires from flying under pressure from husband after a colleague is killed during one of her shows.